I want to document this moment for my family but we get so busy that I forget to take the photos. So here is our new home in the hills of Rapid City. It is half the size that we have in MN as well as only 1/2 acre versus the 40 acre hobby farm we are leaving. I know this is a huge step for our family! Here is the front of our home in South Dakota. We have neighbors all around but not too close. Above is our living room and below is the kitchen. After we move out of our MN home I will share MN versus SD home so you can see the difference, a huge difference, see all the white everywhere?? 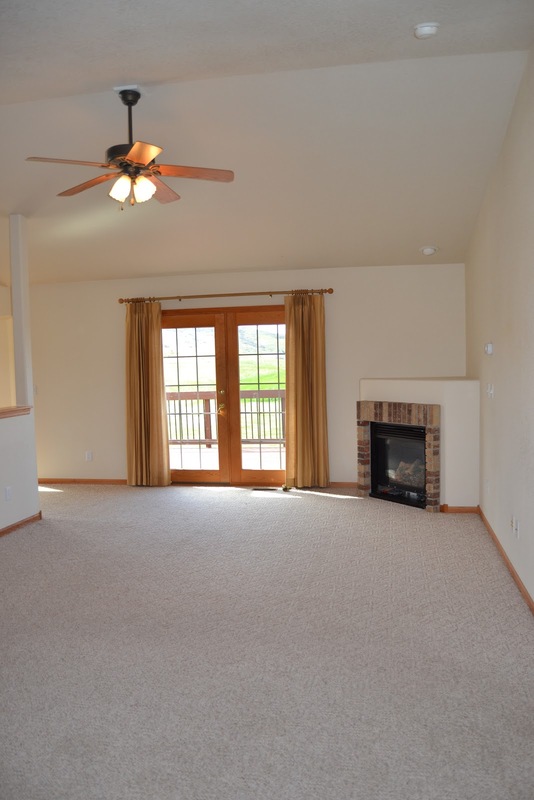 Below is the master bedroom and it is full of light. Here is the inside of our trailer just waiting to be unloaded. The side of the house has a walk out from the basement, very nice and convenient for when the dogs come here to live too. Here is the back of our home, on the left is the Master Bedroom then the the middle is the Living Room and on the right is the dining room. So yes this is quite small and plain but this is the house we always went back to after all the rest kept selling before we could get a offer on them. So we figured this is the one we are meant to start our new adventures with. It has walking trails, a big park with facilities as well as movie nights in the summer all behind our house. I will update more as things progress. Have a great Mothers Day! This is a great home Kelly and I enjoyed seeing the photos and the starting place for your new adventure! Home sweet home !!! Wonderful place !! Thanks for sharing with us these shots ! What a nice home! I'm sure your add your personality to it. I bet you'll be happy to sit and relax again. Thinking of you sweetie and no matter what you will always be my country sista! I love your new home, Kelly!!!!!! The kitchen is so spacious.....mine is a walk-in kitchen and I never liked it!!! I like having neighbors, BUT NOT TOO CLOSE!!! Perfect choice!!!! That's a huge change from country life, but I think a welcome change. My comment was lost in blog heaven...so I'll do a redo! Fantastic home...love the land! Can't wait to see your craft room all set up! Compared to UK homes, this looks really spacious, but oh how I feel your pain on the downsizing. I've still got a whole container of stuff in storage, trying to work out what gets to stay and what is really on the way out. Sounds like a real family effort is under way to make a success of this new adventure, and I'm sure you will! This looks like such a gorgeous spacious home. Please share your craft room when it is set up. Lovely home...I love all the space. and love the neighbours being far! nothing like I have here!!! Happy Mother's day Kelly. Hugs. !